This is Plaza Tapatia. It spans about 17 acres and here you can see Hospicio Cabañas in the distance, where many breathtaking murals by Jose Clemente Orozco reside. They are considered by many people the most beautiful works of art in Mexico. Right on top of this circle is a "resting area." This little attraction is right in front of Hospicio Cabañas. I call it a resting area because there are quite a few bronze like figures in the shape of chairs! You can sit on them and take pictures. If you have any children I think they'll get a kick out of these. Another shot of Plaza Tapatia. 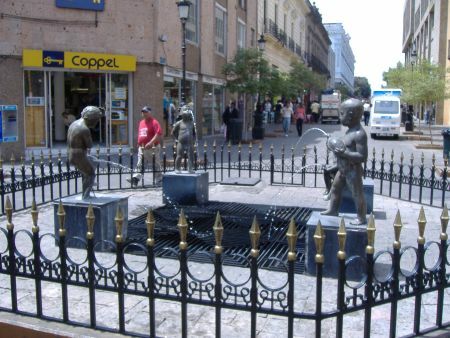 This whimsical little fountain shows some young boys playing around with the water. The little statue on the left is actually "urinating" in the fountain. Too funny. 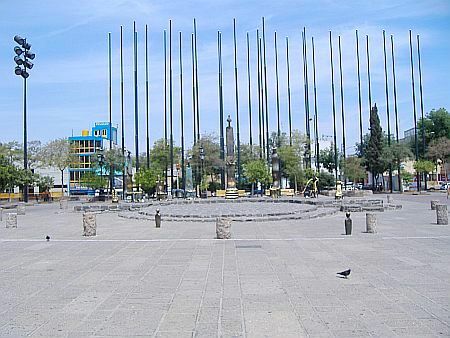 Here is another picture of Plaza Tapatia. When I first saw this statue I thought it was just there for decoration. 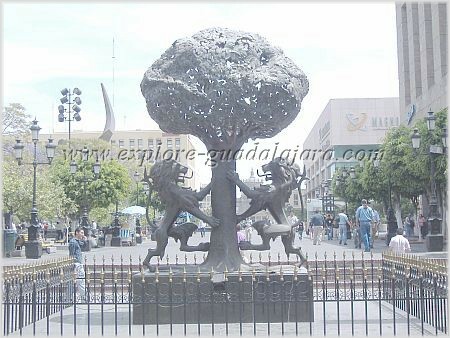 I later found out that it's a replica of Guadalajara's Coat of Arms(Escudo de Armas). 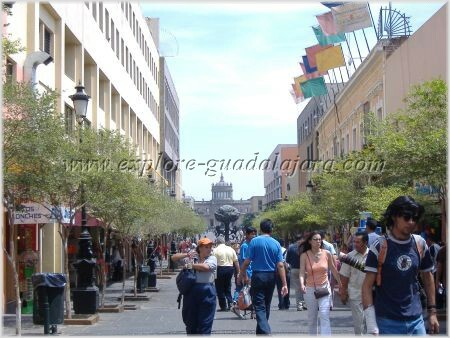 Guadalajara was given the coat of arms in 1542 by Emperor Charles V, when the city was first established (Guadalajara History).